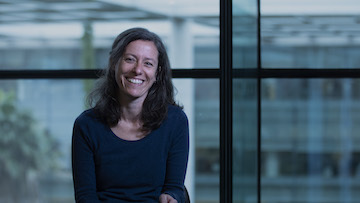 Marta Moita, Deputy Director of the Champalimaud Research Programme and group leader of the Behavioural Neuroscience lab at the Champalimaud Centre for the Unknown, in Lisbon – Portugal, was awarded a two million euros grant from the European Research Council (ERC) to advance her innovative work on the neural basis of defensive behaviours. When Marta Moita received a Starting Grant from ERC five years ago, little was known about the variables and brain mechanisms that lead individuals to opt for a specific defensive strategy at any particular instance. In Moita’s opinion – which she has proven right, leading her now to receive a follow up ERC Consolidator Grant – an innovative approach was needed in order to gain new insight into this topic, which bears significance to all animals, including humans. The approach she took was to study this question in an organism that measures mere millimeters, the fruit fly. “When we began the project of the ERC Starting Grant, we wanted to know whether the fruit fly can teach us how the brain chooses which of the three canonical defensive behaviours to apply when faced with a threat: escape, fight or freeze in place”, she recalls. Why the fruit fly? To many of us it may seem as though these insects are too different from humans and other “higher” animals, but according to the results discovered by Moita’s group, fruit flies have more in common with us than we may think. For one, in a study published earlier this year in the scientific journal Nature Communications, Moita and her team demonstrated that fruit flies don’t only try to escape from threats, (as many have thought), but in fact they flexibility choose which defensive strategy to apply depending on what they are doing at the time (they either escape or freeze in place depending on their walking speed the moment the threat appeared), and the team went even further and was also able to identify some of the specific neurons involved. In the next five years, Moita and her team will be focusing on understanding the contribution of the social and the spatial environment to the choice of defensive strategy and on identifying the brain circuits that process the relevant information and execute these decisions. “This project will provide a comprehensive understanding of the mechanism of freezing and its modulation by the environment, from single neurons to behaviour. We expect to find principles of organisation that can be generalised to other species, as were found in the olfactory and visual sensory systems of insects and mammals”, she concludes. To pursue these goals, Moita will use the funds of the ERC grant to employ specialised research scientists, acquire new equipment for additional behavioural experiments, and tools for measuring of the activity of neurons in the brains of flies. A Portuguese scientist working abroad and two host institutions in Portugal are also receiving ERC Consolidator grants. The latter are Laboratório Ibérico Internacional de Nanotecnologia and Universidade Nova de Lisboa.